We are greatly indebted to Trevor and Susan Hill who own the property now called Threeways House and were kind enough to donate their account of the history of the house to Thornbury Museum. They also allowed us to see their lovely home and to photograph their deeds. Please note that for convenience we consistently refer to this house as “Threeways”, although it is now called Threeways House. Edward Mathew died in 1788 and was the owner of neighbouring properties including Fairfield House which he had built just before his death and The Chantry. The land tax records appear to support the theory that the property was sold by Edward Mathew to John Powell in 1777. They show that in 1775 Edward Mathew owned three properties for which tax was payable. These were as follows; Edward Mathew for self £1 8s 0d, Edward Mathew for Pontins £0 6s 0d and Edward Mathew for Vowles £0 2s 3d. By 1780 (after the date of the transaction in 1777) the land tax records show that Edward Mathew owned only two taxable properties. These were shown as follows; Edward Mathew Self £1 17s 4d and Edward Mathew for Pontins Self £0 8s 0d. John Powell’s name was listed next and showed John Powell self £0 3s 0d. This would indicate the sale had taken place but does not necessarily tell us what kind of property this was or whether there was a house on it at this time. Sadly we cannot find John Powell in later land tax records and we cannot explain why this is the case. John Powell. We believe that John Powell was baptised 22nd February 1740 and was the son of Thomas and Ann Powell. He married Betty Taylor in St Mary’s Church on 10th May 1772. John Powell and Betty had nine children spread over a period of 21 years: Ursula born on 4th April 1773 and baptised on 18th April, John born on 26th June 1775 and baptised on 9th July 1775, Elizabeth on 3rd May 1778, Anne in 1780, Maria born on 22nd January 1784, Dinah born on 23rd September 1786, William in 1789, Susannah born on 20th March 1795 and finally Paulina on 15th March 1792 when we think her father was aged about 52. John was described as a labourer in the parish records that relate to the baptism of his children. However he also seems to have been a sexton of St Mary’s Church. We understand this to mean that he was responsible for the maintenance of the church and its graveyard. John Powell died on April 5th 1819 aged 80 years. His wife Betty died December 17th 1815 aged 63 years. Ursula Powell was buried in Thornbury on 15th September 1802 aged 29 years. John Powell junior did not marry. John became the next owner of this property. Please see below to read more about John. Dinah Powell appears to have married Thomas Summerville. Despite this being an unusual name we have no records relating to this pair. Paulina Powell married Robert Coleman of Bristol. Their son George was born about 1830 and died on March 28th 1833 aged three years. Paulina died on January 11th 1848 aged 55 years. By the 1841 census her daughters Mary Ann and Emma were staying with their uncle John and the lady who may have been their aunt Nancy. They were living in the house that John had built which later became Wellbourne Cottage. By the census of 1851 Mary Ann and Emma were living in the house that their uncle had built. Mary Ann died aged 24 on February 20th 1852. Her sister Emma married Henry Fletcher Carter. The will of John Powelll junior written in 1847 also refers to his nephews William Coleman railway porter of Highbridge, James Coleman, grocer of St Pauls, Bristol and John Coleman beerhouse keeper of St Pauls, Gloucestershire. We believe that these may also be descendants of Paulina and Robert Coleman. In a document dated ‘the fifty-ninth year of the Reign of George III’ (which we believe to be about 1819) the heirs of John Powell senior; Thomas and Ann Freestone, William and Maria Terry, Thomas Henry and Diana Summerville, William and Ann Powell and Robert and Paulina Coleman appeared at the Court of Westminster and accepted £60 to waive their rights to five-eighths of the two messuages that made up Threeways. They accepted the money from Joseph Longman whose right to the property they acknowledged. At this stage we don’t know how Joseph was connected to the Powells, but suspect that he may have held a mortgage on the property. We have not yet seen the will of John Powell senior but we assume that the heir to the remainder of the property was John Powell junior. John Powell junior. John was born on 26th June 1775 and baptised on 9th July 1775. He was the eldest son of John and Betty Powell (see above). John Powell junior became a mason. He seems to have been something of a property speculator. We know for example that on 23 September 1807 he bought property in St John Street from Thomas Rolph for £63. It appears that at the time of the purchase, there were two houses already on the land, converted from an earlier single residence. The deeds say that John “erected and built two houses on the site or place whereon formerly stood two messages or tenements heretofore in one messuage”. The two new houses later became known as 7 & 9 St John Street. It is noteworthy that the indenture of 1807 that conveys ownership of this property also makes reference to Joseph Longman who is described as a yeoman. We assume that this is another instance in which Joseph Longman provided the funds for this property by way of a mortgage. When the “devisees of John Powell” sold these properties in 1850 for £150 there was no mention of Joseph Longman and so we assume this loan was paid off by then. When his father died in 1819, John Powell junior became the owner of Threeways although as we have already mentioned there seems to have been a court case resulting in his siblings waiving their right to their share in the property, presumably because Joseph Longman held a mortgage in respect of this property as well. However the 1819 land tax shows only one property owned by John Powell and that was occupied by Jesse Price. The land tax records continued to show only one property owned by John Powell until 1825. We know that John Powell owned more than one property at this time and cannot explain this discrepancy. John appears to have been busy exploiting the potential of his inheritance. He built the new house, the pink part of the building shown in the photo at the top of this page that adjoined the small older property where his father had lived. We suspect that he also built another house that later became Wellbourne on part of the land, although we haven’t seen the deeds of this property yet. The land tax records for 1825 show that by that date John Powelll was paying tax on two properties, one occupied by himself at the rate of four shillings and one occupied by Jesse Price for two shillings and one penny. We are unable to positively identify these properties. By 1840 the Tithe Map showed two of the properties owned by John Powell in Castle Street as Plots numbers 22 and 23. They were both described as houses and gardens. Threeways on plot 22 was being let out to William Bevan and John was occupying Wellbourne on plot 23 himself. The Tithe Apportionment shows that John Powell owned six properties in all. The census of 1841 confirms that Threeways was occupied by a tailor called William Bevan while John Powell and Ann (or Nancy) lived at what became Wellbourne. We do not know who” Ann” or “Nancy” Powell was. His will refers to her as “Ann Powell, singlewoman.” Staying with John and Nancy at the time of the census were their nieces Mary Ann Coleman aged 12 and Emma Coleman aged six. ‘which said messuage or tenement and hereditaments hereby released are situate in the borough of Thornbury and contain according to a recent admeasurement of the said parish 13 perches or thereabouts and are numbered 22 on the tithe commutation map for the said parish. And bounded on or towards the south by the street or highway there on or towards the north and west parts by an orchard belonging to Joseph Parslow esq and a garden belonging to captain Robinson and on or towards the east by the said garden and premises of him the said John Powell party hereto and were late in the occupation of Hester Higgins widow as tenant thereof but are now void together‘. John Powell died on 18th July 1849. By his will dated 8th September 1847, John Powell left the “messuage or dwellinghouse, garden, well of water and premises” (Wellbourne) that he then occupied to his niece Mary Ann Coleman, the daughter of his sister Paulina. If she died before the age of 21 or without issue the property was to go to Mary Ann’s brother, William Coleman. The two houses adjoining together in the occupation of Mary Olive and William Bevan were to go to Ann Powell a singlewoman who was living with him at that time for her life time. After the death of Ann Powell the properties were to be jointly owned by the five children of his sister Paulina three nephews, William, James and John Coleman and his nieces Mary Ann and Louise (the wife of Henry Park) and another nephew Thomas Liddiatt. These properties later became 7 and 9 St John Street in Thornbury. An indenture dated 21 March 1850 says that at the time the will was written (that is, in 1847), Ann was then residing with John, but she had since deceased. John’s heirs were now his nephews and nieces: William Coleman railway porter of Highbridge, James Coleman, grocer of St Pauls, Bristol, John Coleman beerhouse keeper of St Pauls, Gloucestershire, Mary Ann Coleman, Louisa Park, widow of Thornbury, and Thomas Liddiatt cordwainer of Thornbury. Thomas Powell. In a Conveyance dated 5th May 1845, John Powell sold a “messuage and garden together with outbuildings, courtyard” etc to Thomas Powell for £160. This was the house we are calling Threeways. Thomas Powell was baptised on 17th January 1813 and was the son of William and Ann Powell. Thus, Thomas was the nephew of John Powell junior who had previously owned the property. In the census of 1841 Thomas, then aged 29 was a stone cutter. He appeared to be living with John Morgan a tailor aged 42 and his wife Elizabeth aged 30 and their sons, Thomas aged 15 a shoemaker’s apprentice and Charles aged 9. They were then living at 46 Castle Street. Thomas married Eliza Beardmore on 9th March 1847. Eliza was the daughter of Theophilus Beardmore a farmer. She was born in Abbots Bromley in Staffordshire. Their first child Thomas William Powell was baptised on 4th May 1848. Thomas (senior) was described as a stonecutter. They had daughter, Harriett Elizabeth Powell baptised 7th June 1849. Sadly Harriett died aged 11 months and was buried in Thornbury on 4th June 1850. A second daughter, Bertha Hannah Powell was baptised 23rd November 1851. William John Powell followed on 28th September 1853. Another daughter Sarah Ann Powell was baptised 3rd May 1857. This was just one indication of many that Thomas Powell had severe financial problems. On 25th March 1858 Thomas Powell and William Woodruff (who was described as his mortgagee) conveyed this property to Caroline Lewis. William Woodruffe had loaned Thomas Powell on two separate occasions (in 1852 and 1855) the sums of £70 and £30 using Threeways as security. Thomas seems to have managed to pay the interest on these loans and that owed to Caroline Lewis but could not repay the capital. Caroline Lewis now agreed to pay £190 for Thomas’s property. Of this £100 was to go to William Woodruffe, £50 was to be retained by her in respect of the loan she had already made to Thomas Powell and £40 was to be paid to Thomas. It would seem that despite this conveyance Thomas Powell and his family continued to live in the house for a while. Indeed the 1859 rate book appears to indicate that Thomas Powell owned and occupied Threeways. The 1861 census also shows the family lived in Threeways. Thomas was then a monumental mason aged 48 and his wife Eliza was ten years younger. Their household was a large one. It included their children; Thomas William aged 13, Bertha Hannah aged 9, William John aged 7, Sarah aged 4 and Frederick Charles aged 4 months (Thomas had been baptised on 27th March 1861). Their nephew Thomas Liddiatt a shoe maker aged 36 lived with the family as a boarder. Mary Olive seems to have a separate household in the same property. Mary was 45 and the widow of a tallow chandler. The rate book of 1862 shows that Thomas Powell was no longer the owner or occupant of Threeways. His name was crossed through. Thomas Liddiatt was now the occupant (see tenants below) and Caroline Lewis owned the property. Probably Thomas and his family moved into what later became 42 Castle Street at this time, although we are unable to confirm this until the rate book of 1867. The 1871 census shows that Thomas Powell aged 59 and a monumental mason was indeed living at 42 Castle Street. He was married to Eliza then aged 48. They had two sons still living at home with them. The older son, William Powell aged 17 was a plasterer and Frederick Powell aged 10 was still at school. In July 1871 the sale of the house on the east side of Castle Street (probably 42 Castle Street) was advertised in the Bristol Mercury. The house was said to be in the occupation of Thomas Powell. Thomas’s wife Eliza died aged 49 years and was buried on 2nd November 1872. Thomas Powell himself died on 4th September 1876 aged 63. Caroline Lewis. In a Conveyance dated 25th March 1858, Thomas Powell sold Threeways to Caroline Lewis, a widow from Olveston. Caroline was born 22nd December 1802 and was the daughter of Joseph and Catherine Hume. Click here to read about the Hume family. Caroline had married William George Tredennick Lewis, a Captain in the 41st Regiment of Madras Native Infantry. He was a D.A. Adjutant General at Bellary. William died 9th October 1839 aged 38 years and was buried in India. Caroline came to live in Thornbury, presumably because other members of her family, such as her sisters Catherine the wife of Edmund Lloyd and Eleanor the widow of John Rodney, lived in the area. In a lease dated 25th March 1862, Caroline Lewis agreed to rent “a house and garden in Thornbury late in the occupation of Thomas Powell, stone cutter” to Thomas Lydiatt, a shoemaker. The annual rent was set at £11, payable quarterly. The lease period was to last until one or other of the parties gave lawful notice. Thomas was not allowed to sublet it and the lease would be invalidated if he ceased to reside at the property. Henry Hume Lloyd. On the 4th of January 1883 an indenture between Mary Dorothea Hume and Henry Hume Lloyd conveyed the property (tenanted by Thomas Liddiatt) to Henry Hume Lloyd for £192. Click here to read about Henry Hume Lloyd. Henry Lloyd lived at Fairfield House and worked as a solicitor at 12 The Plain until his death on 4th March 1904 aged 69. 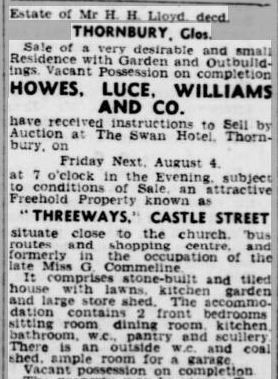 On 22nd July 1950 the Western Daily Press advertised that the Estate of H.H. Lloyd Esq. was to sell the property known then as “Threeways” by auction at the Swan in Thornbury. Stanley Charles and Ethel Gladys Mossman. On the 14th February 1951, John Gammon Wicks and Violet Emily Lloyd agreed to sell Threeways to Edith Emma Guilbert (of Dorset), with Stanley Charles Mossman, of Bristol and a Representative for General Motors as the “Sub-Purchaser”. The arrangement seems to be an unusual one. The house was sold for £2,920 to Edith Guilbert who in the same document agreed to sell it to Stanley Mossman for £2800. The property, which consisted of outbuildings as well as a dwelling-house and gardens totalling 13 perches, now belonged to Stanley Mossman. Stanley Charles Mossman was born in Camberwell in 1915. He married Ethel Gladys Windridge in 1938, also in Camberwell. Ethel’s birth was registered in Camberwell in 1916. They had two sons Keith and Peter whose births were registered in Chipping Sodbury and a daughter Jane (whose birth was registered in Thornbury). Stanley Mossman secured loans from the Rural District Council of Thornbury to assist with “altering, enlarging, repairing and improving” the property in order to complete “a house fit for immediate habitation with all proper drains, sewers and conveniences.” Work was required to be finished by 24th June 1953. Stanley Charles Mossman died intestate on 11th March 1973 and the High Court ruled that his estate should pass to his widow, Ethel Gladys Mossman and Peter Charles Mossman both of Thornbury. Robin and Patricia Netley. By a Deed of Exchange dated 8th November 1974, Ethel and Peter Mossman exchanged Threeways, 56 Castle Street with Robin Netley and his wife Patricia. The Mossmans received the Netleys’ former house at 14 Park Road, Thornbury and an additional sum of money “by way of equality of exchange”. Robin Netley was a building surveyor who had his own Company (R.J. Netley & Associates of Berkeley Square, Bristol). During 1978 and 1979 he applied for and received planning permission and a building warrant for works to be carried out to alter and extend an existing outbuilding of Threeways to form an additional single private dwelling house, in accordance with a revised plan received by Northavon District Council on 26th May 1978. In a conveyance dated 18th November 1979, the Netleys sold the parcel of land with planning permission to Mervyn Douglas Hurn of Thornbury. Over the course of the next two years, the building of what became Turnberry House (an un-numbered dwelling between numbers 56 and 54 Castle Street) was duly carried out by Mr Hurn. 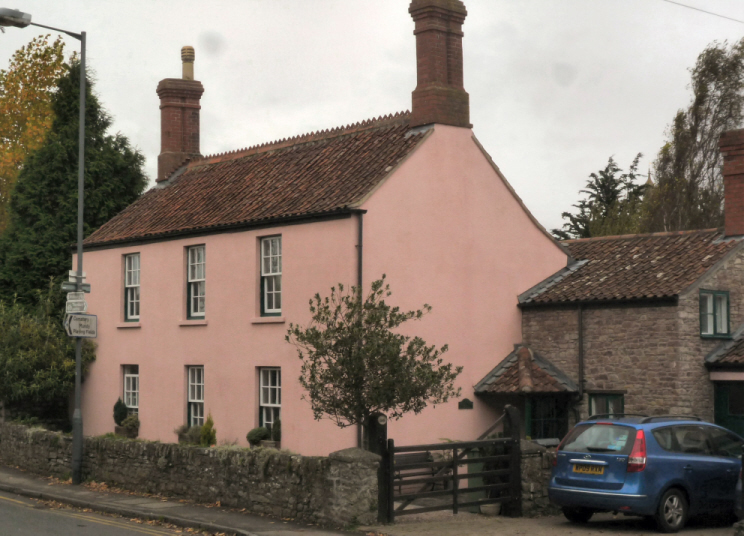 In a conveyance dated 11th April 1983, the Netleys sold Threeways, 56 Castle Street, with its now smaller plot of land, to Trevor George Hill and his wife, Susan Ann.